For liability reasons, they’ll only be present in large numbers if they’re vastly safer than human-driven cars. They’re likely to adopt an aircraft control model, where safety is ensured by constant inter-communication and regulation. 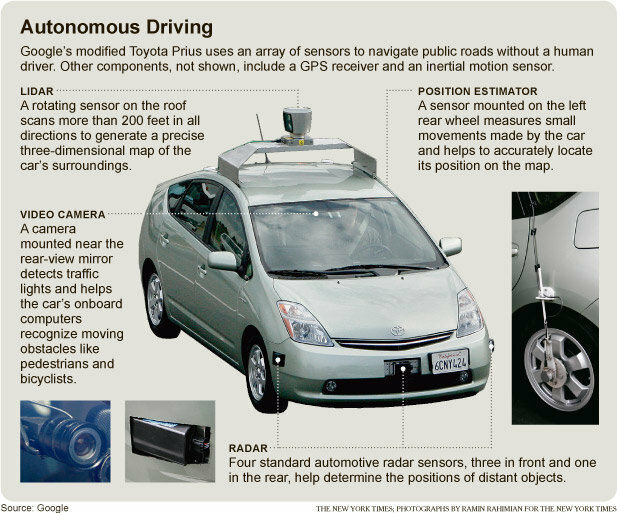 Similar software among vehicles could lead to common mode errors and mass accidents. It can handle urban and rural streets, and Google is pushing for it to be legalized in Nevada, but it still has a supervising driver. Hayes is writing for a serious magazine and so needs to keep his speculation fairly grounded, but a blogger is under no such restriction. What else might happen in the age of driver-less cars? To start with, you have to wonder about his basic premise – that liability issues won’t kill this baby in the cradle. It’s hard to imagine any kind of software getting to the necessary level of reliability. Space Shuttle software still failed, and it operated in a far more restricted domain than a car would. All it had to do was fly through open air and empty space, rather than drive with rain and snow and squirrels and pedestrians. It would be so easy for something to go wrong, and the consequences to the software provider would be so dire, that I can’t see how this would ever work legally. An accidental death in the US gets priced out at a couple of million dollars, depending on the age, income, and number of dependents of the victim, so it doesn’t take many of those to bankrupt you. But let’s grant for the sake of argument that these systems can be made ultra-safe. We’ll wave hands and invoke Google-ish AI techniques where the car compares its current situation to billions of similar ones stored on the cloud. People might not go for it even then for personal vehicles. After all, cars are probably the most important status symbols that people own, after their clothing. This is mainly due to massive investment by car company advertisers, but there are a huge set of signifiers associated with them. Are you a middle-aged guy in something low and sleek? That tells people something. How about a mom in a tank-like SUV? A hybrid with a distinctive shape to let people know your greenitude? A mud-stained pickup with a gun rack? Look at someone’s car, and you’ll know their consumer segment immediately because of years of subliminal training. Plus, lots of people like to drive, including me. I don’t even like automatic transmissions, and get so annoyed by cruise control mistakes that I rarely use it. Driving is one of those simple and pleasurable physical skills, like ice skating. It’s not naturally that way, but it’s become it through millions of person-years of engineering. So individuals may not give up their cars that easily, but commercial vehicles are under much less constraint. Once safety is assured, robot trucks and delivery vans have lots of advantages. A key one is being able to operate in the middle of the night, when labor is at its most expensive but the roads are the most open. Darkness shouldn’t bother a vehicle with lidar and radar senses. Nighttime is when mail and packages should be delivered, assuming it’s done by quiet electric vans. That’s when garbage should be picked up too. Many towns are already requiring trash to be in standard bins that the truck itself can pick up, so removing the driver is the next step. And of course nighttime is the best time for long-haul trucking. Shifting truck traffic to nighttime will lessen congestion everywhere. Fast and cheap delivery, though, means trouble for retail. Amazon is already breathing down the neck of every store in the country. It already has advantages for distribution because of volume and automation. On-line retailer warehouses are already getting roboticized, E.g. by Kiva Systems bots that move bins of products to tables where people can pack them. Self-driving vans and trucks will take another whack out of distribution costs, making on-line retail even cheaper. This could cause yet another rework of the urban landscape. Pedestrian Main Streets were killed by strip malls once people could drive to them instead of walk. Strip malls were killed by shopping malls, which offered a denser array of goods in a more pleasant environment. 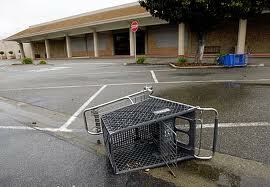 Shopping malls are getting killed by Walmart and its ilk, which cut out sales staff and the overhead of separate stores. But why even drive to Walmart if an electric robot van can deliver you something from a remote rural warehouse in an hour? No going out in the rain, no fighting traffic and lack of parking, and no vast intimidating spaces filled with bad music. Every one of these shifts left debris across the land. Small towns are full of derelict Main Streets, and have bathtub rings at their borders of failed strip malls. A fading shopping mall is a scary place to be, with lots of blank fronts and gangs of restless teenagers. Now the big-box stores are likely to go the same way, with vast acerages of parking lot going to weeds and birds nesting in their steel roof trusses, now exposed to the sky. Even the largest artifact of the 20th century, the road system, could be overturned. The CIA says that there are 4 million km of paved roads in the US, which must contain billions of tons of asphalt. They’re paved for the sake of safety, but if the robot can drive far better than you can, who needs them? There’s no public money to maintain them anyway. Use adaptive suspensions to handle rough surfaces and sell off the asphalt as hydrocarbon feedstock. Great robot road-chewers could roam across the landscape, munching up the now-useless roads for their carbon, while burning some of it to power themselves. So if cars can get to the intelligence level of horses, maybe we can go back to the minimal infrastructure needed by horses instead of the vast and ugly road systems needed by dumb cars. We can go back to 19th century greenways instead of 20th century roadways. Our towns can be social gathering places instead of given half over to parking and retail. And maybe we won’t have tens of thousands of people being killed by cars every year. Cars killed 37,000 people in the US in 2008. Compare that to 12,000 killed by guns in that year (not including suicides). Cars are 3X more dangerous than machines deliberately designed to kill! Maybe it would be worth a few software failures to get those numbers down. This entry was posted in Uncategorized and tagged electric-cars, sf-ish. Bookmark the permalink. I think you’re on the right track about automatically driven cars taking on particular segments of the transportation market, such as delivery, first, before they replace individually driven cars. However, cars are so linked with US notions of individualism and freedom that they won’t go away for a long time. It is true that they are unsafe and have significant externalities (such as the cost of maintaining the highway) but that just means they will get better. There is so much potential in new motors, new materials, new smarts. in urban settings. These can be incredibly efficient. Probably not first in the US, due to ossified infrastructure and politics, but rather in rapidly growing countries like China or Brazil.